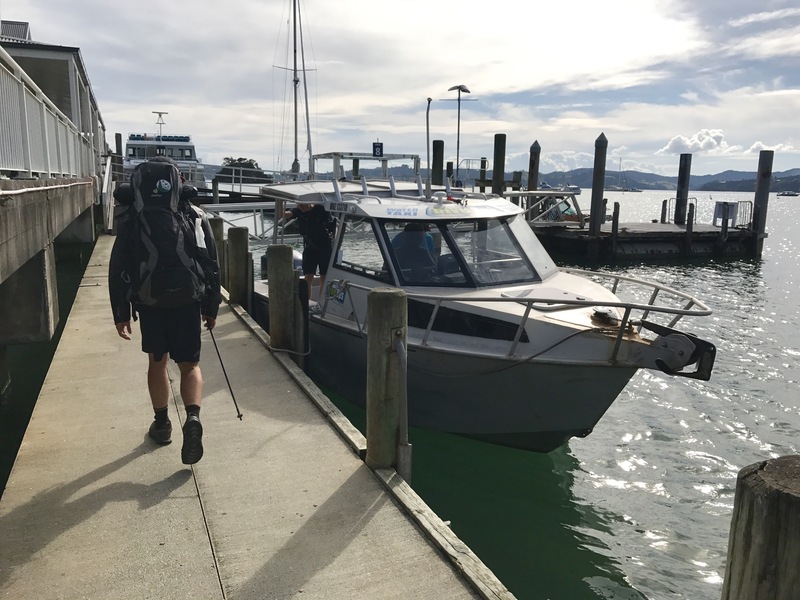 Today we continued from Paihia after our rest day yesterday – we took a water taxi from downtown Paihia to Waikare, along with an American named Luke who we met in Kerikeri, and two hikers from Holland who we stopped along the way to pick up. We’re feeling quite knackered after our full day today: though we only actually hiked 27 or so kilometers, we started walking at around 10 AM in Waikare so we had to hike fast in order to make it all the way to our destination (and along the way 4 km of it was through a rocky stream which slowed us down some). 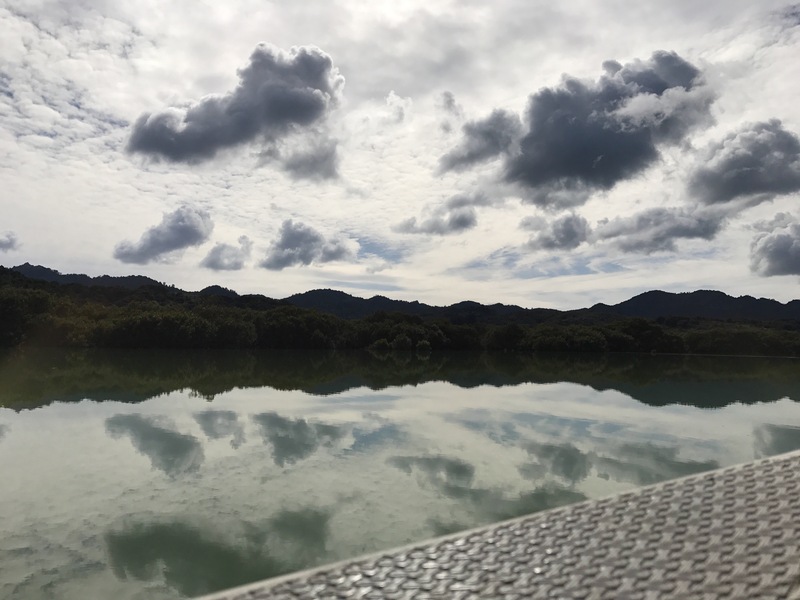 For the most part though, the walking wasn’t hard- we started out from where the boat dropped us in Waikare on gravel road surface and even into part of the forest the trail was still ATV-type track. Maneuvering around farms deep in the woods the trail gradually became skinnier and had more growth, and eventually we dropped down into the rocky riverbed. 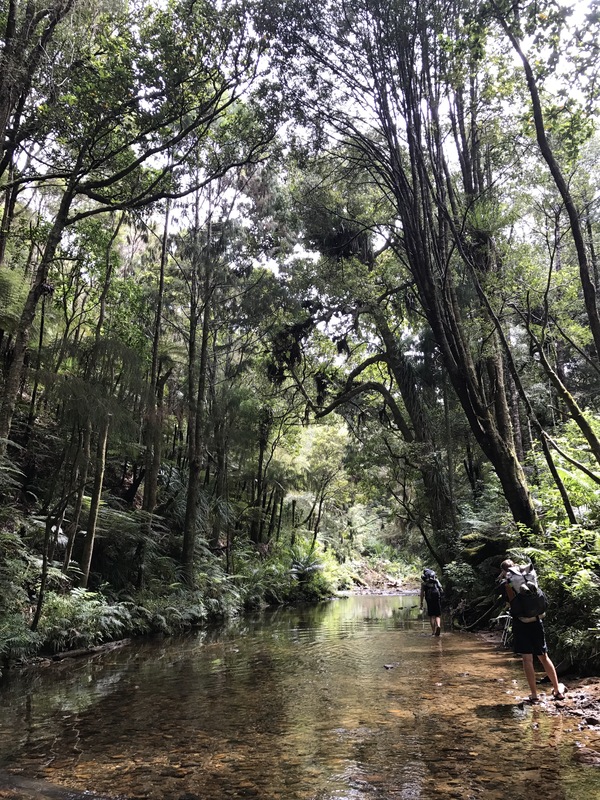 We slogged from shoal to shoal for about 3 or 4 km and then followed a trail leading up the right bank which led us through some slightly boggy sections to what’s described as a DOC hut but is really just a pagoda with some benches and some l a m e quotes written on the posts. There we enjoyed our staple meatstick and peanut butter lunch wraps and tried some new adventurous spicy gorp crafted by Jasp and Shep which they kinda don’t like but I think is very nice and fun and good. We finished up the foresty section which wasn’t too hard, got spit out onto a highway, and started hiking south- as that road walk dragged on the hardest couple hours for me started, mostly in a mental, road-fatigue way, as we really wanted to push to get as far as we could before nightfall and ended up continuing walking much later than usual. 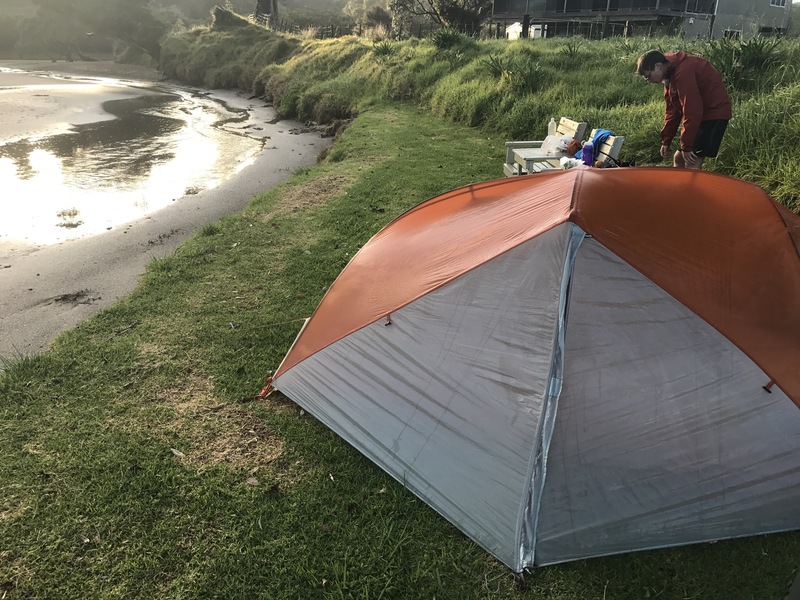 We started looking for somewhere to camp around Mokau, but struck out and even past there at the quarry we realized we couldn’t take advantage of the flat ground because we didn’t have enough water to camp. So we walked down the hill towards Helena Bay and Teal Bay and at around km 290 stopped to fill up water at a stream. 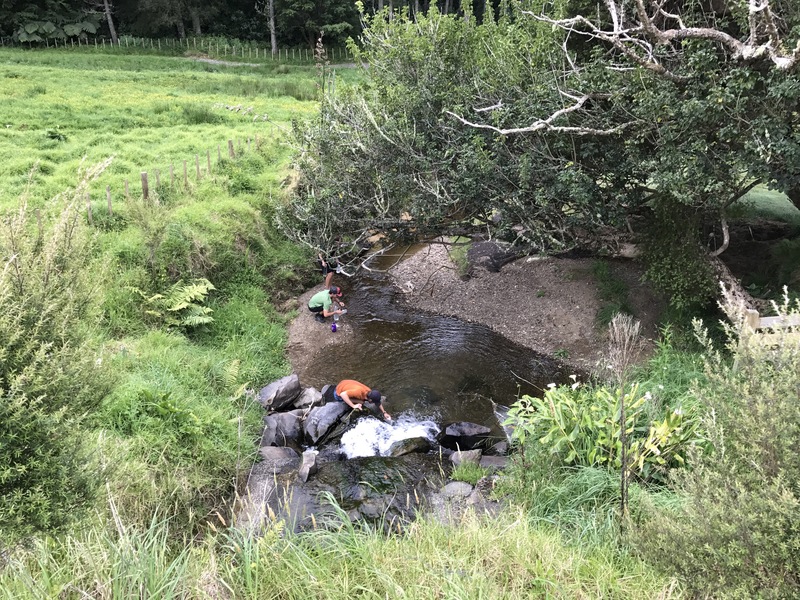 We were surprised to see that the property that the stream wound through was immaculately landscaped, with a nice private horse trail and a huge front lawn mowed into a diagonal pattern. We walked up the driveway to the gate and noticed an electronic keypad with a speaker, and two or more security cameras trained on the spot we were standing on (with a sign that explained there was 24-hr video surveillance). We thought it was weird but we might as well give them a ring since the lawn was just too SICK to pass by, so we sent Jack to the speaker and he turned his Southern charm up to eleven. He rang and a woman answered who deferred his question about camping on the lawn to a different guy, who said that there would be someone there in 3 or 4 minutes to “check us out”. So we waited and a Polaris golf cart came down the hill (from what we guess was the house at the top of a long driveway, semi-hidden behind a hilltop). Bob, in a wide-brimmed hat and a fleece vest, stepped out as the gates glided open and informed us that this was in fact the most expensive property in New Zealand that we had happened upon – our hearts lept in hopes we would be ushered inside and into a mansion dug deep into the hillside, where we would each sleep in our own rooms and eat fresh produce and play billiards with a Kiwi construction tycoon. But alas, Bob, who looked like he was one of the property managers or caretakers or something said actually it would cost us four thousand dollars per night to set up our little tents on the lawn, and so we declined but got to chatting and he said it wasn’t actually a family who lived here but a “holding company” who owned the property. 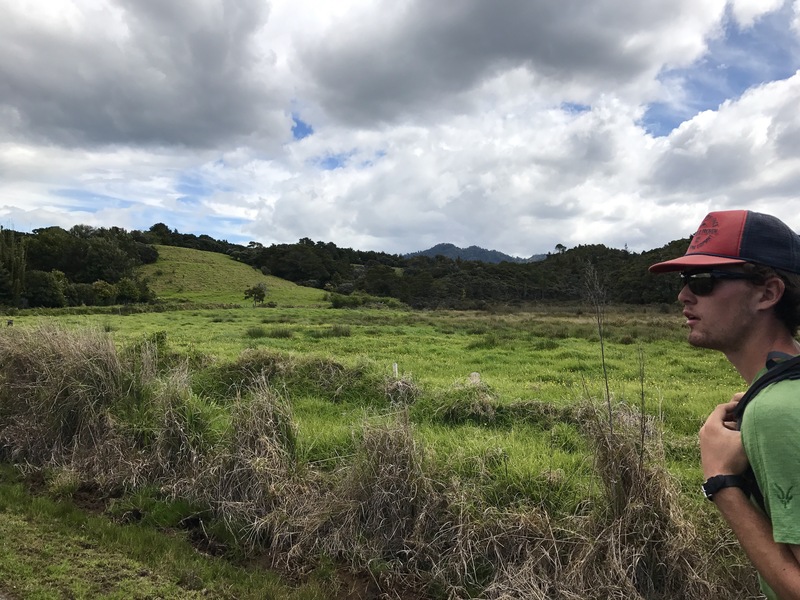 He said he dug what we were doing, though, and recommended we look further down the road towards Teal Bay for some freedom camping areas. So we kept walking, in shock for a little bit at our stumbling upon that place, and wound our way for about a half-hour towards the little turquoise horseshoe of Helena Bay and Teal Bay, where we came across a couple recreational reserves, both of which had very prominent no camping signs. At the second one we found (right on the water) we turned around back into the seaside neighborhood at around 6:45, and sent Jack again to knock on the first door we came across, hoping to glean some local knowledge about potential places to camp, and to our surprise and joy Auckland transplants Carol and John and Carol’s mum Molly have been our hosts for tonight! We set up tents out by their lawn towards the ocean and ate a quick cous cous dinner – the food so nice they named it twice – and then were invited inside for a lovely chat, some coffee and tea, and some AMAZING shortbread cookies and little gingery orangey frostinged pastries. We chatted about the trail and the hikers they’ve seen come through for the past year or so since they moved here full-time. A lovely couple and a lovely conclusion to our long and tofu day. We just came back out to our tents as the cold and wind and the rain we experienced during dinner paint a bleak picture for tomorrow morning’s weather- we made ourselves promise we’d wake up at 6:30 and get hiking even if it’s raining and terrible in the morning. For now we are cozy and hope to sleep well and heal our blisters. Good luck to Jack and Shepard in the Tarptent: it has a habit of accumulating condensation and since it’s a single-walled tent that condensation gets alllll over whatever and whoever’s inside it. What a day! All I can say is: Thank God for little gingery orangey frostinged pastries. Much love to you all!